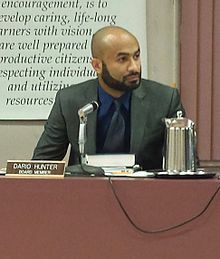 Dario David Hunter (born 1983), also known as Yisroel Hunter, is an American-Israeli lawyer, rabbi, educator and politician. He is considered the first Muslim-born person to be ordained as a rabbi. Hunter is openly gay and was raised by his Iranian Muslim father and African American mother in New Jersey. On January 21, 2019 Hunter announced he was forming an exploratory committee with the plans of seeking the Green Party nomination for President in 2020. He announced his candidacy on February 18, 2019. ↑ 1.0 1.1 1.2 1.3 1.4 1.5 "Biography". The Kosher Unicorn. Archived from the original on May 11, 2012. Retrieved August 26, 2012. ↑ "Youngstown News, Politics - 2016 Primary Election - Dario Hunter for Youngstown Board of Education". The Vindicator (vindy.com). Retrieved June 28, 2016. ↑ Skolnick, David (January 30, 2015). "It's off to the races in Youngstown". The Vindicator. Youngstown, Ohio. Retrieved April 1, 2016. ↑ "NYC: Ex-Muslim to be ordained as rabbi". YNetNews.com. July 7, 2012. Retrieved August 26, 2012. ↑ "Black Jews You Should Know, Part 4". Tablet Magazine. February 25, 2016. Retrieved June 28, 2016. ↑ 6.0 6.1 "Muslim-born American to be ordained as rabbi in New York". Al-Arabiya News. July 7, 2012. Retrieved August 26, 2012. ↑ Staff, WKBN (23 January 2019). "Dario Hunter launches exploratory committee for Green Party presidential nomination". WKBN. ↑ Staff, WKBN (February 19, 2019). "Youngstown Board of Education member announces he's running for president". WKBN. Retrieved February 20, 2019. This page was last changed on 24 February 2019, at 06:42.